Do you have Baptist ancestry? If so, this digitised record of Truth & Progress magazine is an essential search. 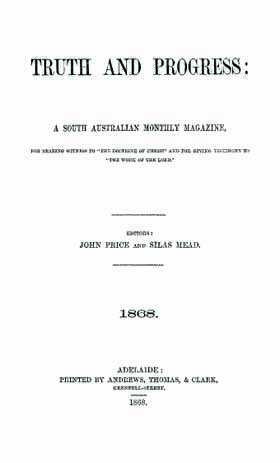 It was the monthly magazine of the South Australian Baptist Churches from 1868 to 1894. One of the main objectives in starting the magazine was to begin frequent channels of communication with the churches, and to record and report important works in the church. These included conversions, baptisms, Sunday School and much more. This is a great collection for those interested in the history of the Baptist Church in South Australia. And if you're researching family history or building your family tree, it's an essential genealogy resource for anyone with ancestry involved in the Baptist faith.